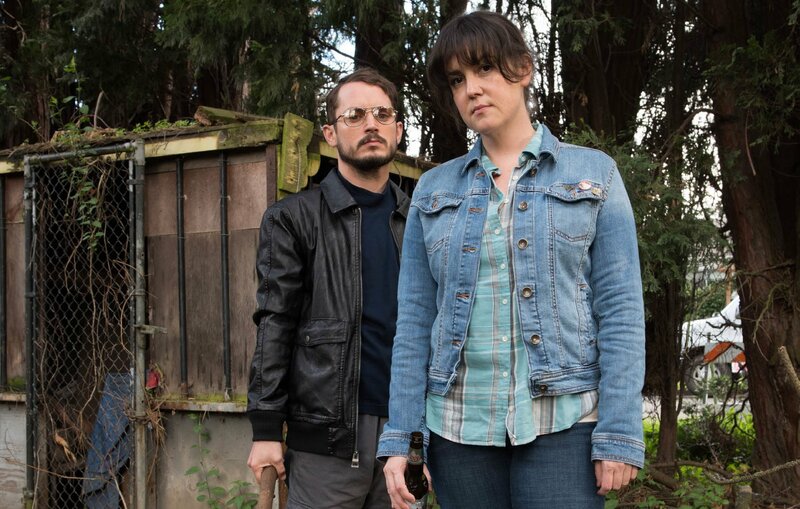 The title of I Don't Feel at Home in This World Anymore is, in the end, slightly misleading. Ruth (Melanie Lynskey) has clearly never felt at home in the world she inhabits. Clinically depressed, alienated from her nominal friends, and awkward in the extreme, Ruth is a pot left to eternally, sickeningly simmer until she boils over, flooding and burning everything in her wake. An early scene sets the stage for the straw that breaks Ruth's back quite nicely: a foulmouthed old lady in her care dies, and Ruth cannot bring herself to tell the deceased's family her true (and truly obscene) last words. When you live in a world of idealistic expectations, we realize, the banality and harshness of this world--the real world--is always jarring, and Ruth's job makes her have to navigate both of these disparate spheres. Following sequences in the movie that show Ruth's quotidian life reveal a world that seems to be full of thoughtlessness and miscommunications, concluding in a brief moment where Ruth picks up after a random dog which has relieved itself on her front lawn. The proverbial straw, then, is a home burglary that Ruth notices when she comes home one day. The perpetrators have stolen various items of importance, including her heirloom family silver service, her prescription medications, and her computer. After the police fail to be helpful or even proactive, Ruth decides to take matters into her own hands, enlisting her thoroughly strange neighbor Tony (Elijah Wood), the owner of the dog, to recover her items. What follows is a kind of mismatched friends-road trip movie that really only unfolds over the course of a few days, culminating in, almost improbably, a shootout with a wealthy family and their disaffected prodigal son (who was responsible for the original theft) in their McMansion. The quest as narrative and storyline does start out incredibly well, with Ruth initially recruiting Tony once her laptop's location pings on her phone, leading to Ruth getting nowhere with a police dispatcher. Armed with nothing but Ruth's meek façade and Tony's nunchucks, the pair descend into a creepy neighborhood of pot-smokers and manage to recover the computer with only a little excess violence on Tony's part. The confrontation itself is beautifully shot, with the interior of the smokers' house lit up in dramatic greens and reds, the nighttime setting bathing everything in deep shadow. Of course, the pot-smokers didn't steal the laptop--merely bought it from a consignment shop--so on Ruth and Tony go. Of course, Ruth isn't really looking to recover the objects that were stolen from her: at the heart of it all, she's fiercely, desperately hunting down some sense of justice and goodness and kindness that she knows doesn't exist the way she wants it to. 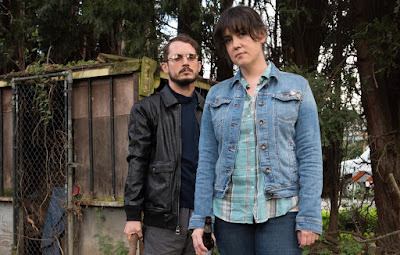 As the narrative of I Don't Feel at Home continues, ironically enough, Ruth actually seems to become more acclimated to the casual cruelties around her as she rises to meet their intensity and fight against them. Unfortunately for the viewer, the disjointedness that characterizes the earlier parts of the film and makes Ruth's misanthropy seem so grounded and relatable shifts into more banal and predictable material by the end. We do feel more at home by the time we watch the gory climax of the movie than we do in the verisimilitudinous first third or so, but only because violence in films is commonplace at this point, whereas, in my experience, truthful and relatable experiences are less so. By the time the movie itself wrapped up, I couldn't help but conclude that it might have worked better as a short film of around an hour rather than a standard ninety-minute model; too many later scenes seem to amble on, sadly diffusing any tension, before culminating in a gunfight in order to spark up the viewer's pulse again. Melanie Lynskey is not an actress I am very familiar with. I seem to recall her from a few television guest spots here and there, but her performance in I Don't Feel at Home in This World Anymore does a clever trick by using Lynskey's naturally soft and delicate voice in contrast with the extreme negativity and rage that eventually grows to consume her. Elijah Wood seems to be channelling the brothers from Napoleon Dynamite (Kip in dress, Napoleon in behavior); his post Lord of the Rings career seems to have him playing roles in some downright weird projects. There's the show where he talks to a person in a dog suit (Wilfred) and the movie where he uses those large eyes and withdrawn body language to portray one of the few actual villains (Eternal Sunshine of the Spotless Mind), as well as his current television show, which has the name Dirk Gently's Holistic Detective Agency--what a name. By the end of the movie, Ruth seems to have accepted what we all have to accept about living in the world: things will rarely ever go the precise way you want or need them to. People will be rude to you; people will hurt you; a dying woman's last remarks will not always be a beacon of benign wisdom. Yet Ruth also finds that people are not always their worst behavior and instincts: despite the cruelty and violence she encounters--and participates in--to reclaim her stolen goods, there are people who will support and befriend you in a time of need. Sometimes those people are just the ones who let their dogs crap on your lawn. I Don't Feel at Home in This World Anymore is available for streaming on Netflix.